As a result of the accumulation of waste metallic in recent times, researchers are working to find possible solutions to reduce environmental pollution caused by these wastes dumps. Some of those solutions are related with robotics, such as Zen Robotic Recycling, which has multiple sensors for accurate analysis. Based on these analyses, the robot can make independent decisions to pick up objects from the waste stream . Zen Robotic Recycling can be used only in recycling factories and some commercial establishments, but it has high-cost and it is non-usable in different environments. We decided to design and implement our own metallic waste collection robot. In this work, some factors have been considered such as cost, size, flexibility, weight, and autonomy. 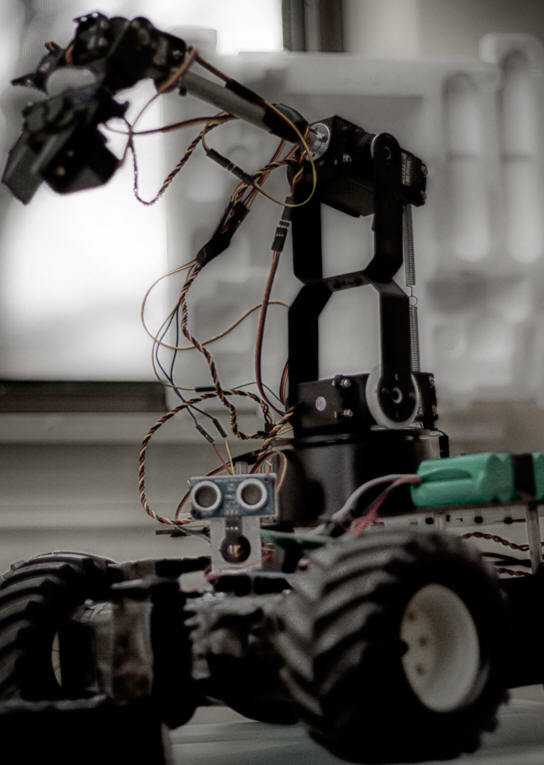 The purpose of this work is to detect metallic objects in a specific area and pick them up by using a robot arm.There are different kinds of microcontrollers that can be used as a platform. These include Arduino, LilyPad, SparkFun and Seeed Studio. Arduino microcontroller on board can be programmed using Arduino programming language. To meet the objective of this work, several sensors such as Ultrasonic sensor, and IR sensor should be used. In order for a metallic object to be picked up, the detector also plays a significant role. There is an IR distance sensor mounted on top of Contraspion is used in this work. It has servomotors that control the movement of robotic arm. DC motors are also used in this work. The Arduino Motor Shield allows the microcontroller to drive the two-channel DC motor. Speed control is accomplished through conventional PWM, which can be obtained from Arduino PWM output pins.